With my ‘Hammer Films – the Bray and Elstree Studios Years’ books well out of print, but still in demand (there are no plans to reprint them and the cost of second hand copies of Elstree are already becoming ridiculous), it seemed opportune to dust off my first book idea from the early nineties when publishers were in short supply. 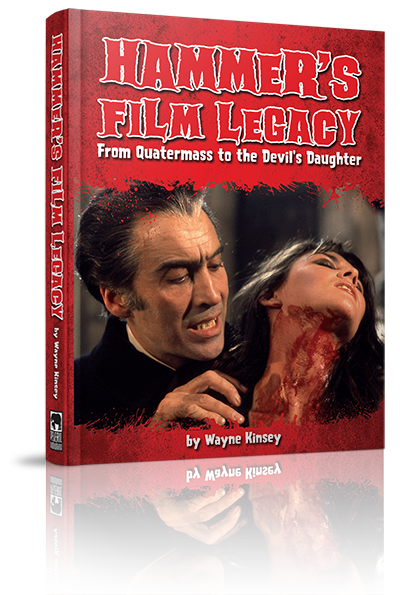 The idea was for a book detailing the making of Hammer’s films from The Quatermass Xperiment to To the Devil a Daughter (1954-75), the era that Hammer fans are most interested in. It combines information I’ve gathered in my first five Hammer books and 25 issues of The House that Hammer Built magazine and so is not just an amalgamation of the Bray and Elstree tomes. Those told Hammer’s story chronologically. It was an ambitious approach, where I wanted to show what was happening at Hammer from day to day, that while they were physically shooting a film, they’d be planning their next one and still finishing off the last one. However, this approach fragmented facts on individual films, which some readers found confusing. So now each film will be separately included (in production order) with their sub headings of pre-production, casting, production, post-production and release. I’m removing the oral history approach of the other books (many of the interview snippets have been used numerous times before) and writing the text in my own words to keep it more concise but still as detailed. I’ve kept the Censor documents in, because I think they give a tremendous insight into how the films were received back then and what Hammer could and couldn’t get away with. Not only that, they’re a scream to read! I’ve also added some of the script comparisons (and some new ones) that were included in the early issues of my magazine. It’s supplemented with lots of rare photos, including many colour ones as a significant proportion of the book will be in colour with presentation similar to our successful Locations book.